Finding a good school in Dubai is an important step if you are relocating there with your family. Although in recent years there has been a rise in the number of international schools, the whole process can be a difficult task at times that requires planning ahead. In this article we’re going to provide information about the schools in Dubai, and provide you with a checklist for consideration when researching your options. There are a number of international schools in Dubai that are open to expat children. Once you have a shortlist of schools you like the sound of, you need to ideally visit the school before enrolling your child therein. 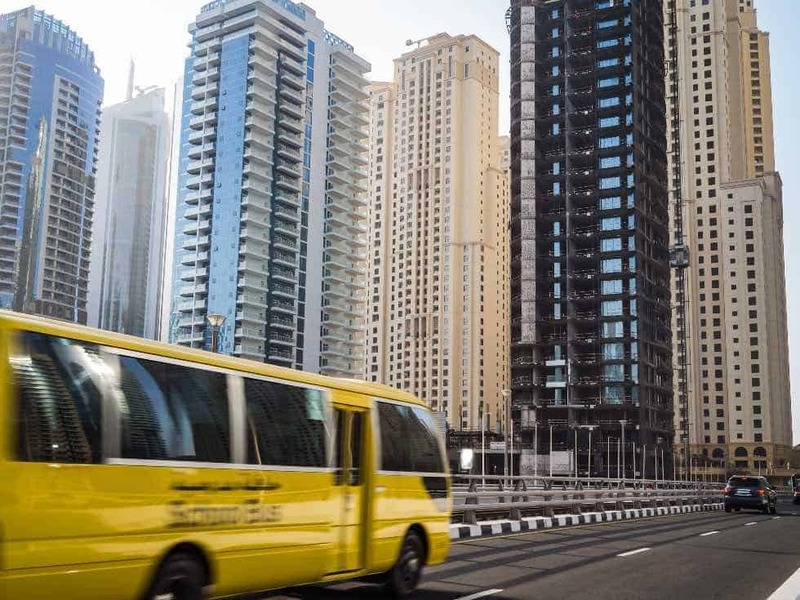 However, unless you’re planning your relocation well in advance and can take a short trip to Dubai to check out schools, it is generally the fact that people actually have arrived and are setting up home and then looking for a school. At which point it can be too late – because all the best schools have waiting lists for places! Getting a child into school in Dubai is therefore no mean feat, you find a decent school, think you can just about afford it and then find there’s at least a year’s waiting list to get your child enrolled! The key is trying to plan a relocation up to a year ahead, and if this is not possible then get your child into any decent school, get their name down on your preferred choice of school in the meantime and top up their education with private tuition if needs be. To enrol a child in school in Dubai you will need to complete an application form and submit it together with copies of yours and your child’s passport, their school records for at least the past 2 years where applicable, and a handful of passport sized pictures of your child – 8 or 10 are usually sufficient. In addition to these documents you will need to present your child’s birth certificate, immunisation records and relevant medical history and some form of official transfer documentation from the former school that details the level of education to which the child has been taught. All of this paperwork goes to the school, and then the Ministry of Education also gets a copy of the transfer document and also the last report card for the child. You may prefer to choose a school that is accessible to your place of residence or employment if you’re already settled in the emirate, and therefore you will be guided by what’s on offer around you. If you have yet to move, it may make more sense to choose the school, and then find somewhere to live within reach of it. Bear in mind that traffic in Dubai is horrendous at rush hour – i.e., when you need to get your child to school or pick it up at home time. Therefore, choosing a school across town from your place of residence will make life unpleasant and stressful for both you and your children. So, think carefully about the location of a school when examining it in terms of its potential suitability. Look at how close it is to that which your child is used to. Additionally, how close is it to the curriculum taught at other international schools in locations you may relocate to in the future, or the education system ‘back home’ in the event you repatriate. The key to relocating a child is to cause as little interruption to their schooling as possible if you want their education to be unaffected. So, look at each school based on the curriculum they follow. Whilst league tables and charts can only ever reveal so much about a given school, they are a good base indicator as to how high your student child could go within the establishment. They are also a reflection on the teaching standards and the standards of other children at the school. All are important initial indicators to a parent of whether an establishment is good enough for their child. Finally, all of this is moot and redundant if you discover that the school you ant to get your child in is oversubscribed. Yes, even in this economic day and age, the best schools in Dubai are full. So, you need to begin your research as early as you possibly can ahead of your relocation, and you need to get your child on the waiting list of your preferred choice as soon as you possibly can. The very first thing that we would like to mention is that foreign students – i.e., expatriate children – are not entitled to any free education in Dubai. Therefore all of the international schools in Dubai charge fees – and this is where the problem begins really, because those fees are generally very high and rising. The government originally set some relatively half-hearted caps on the rate at which school fees could rise, however these caps have been relaxed and some schools are exploiting registration loopholes to push their fees even higher. In 2006 there were reports of fees at some institutions having risen by up to 70%, and this year again there have been reports of schools increasing fees by up to 30%. Fees cover tuition – they rarely cover uniform, transport and other essentials for example. Therefore, if you’re relocating to Dubai you need to look very closely and seriously at your finances to determine whether you can afford the ongoing education of your child at a quality establishment. For those lucky enough to have been recruited specifically to relocate to Dubai and work there, companies sometimes include school fees in a remuneration package. Sometimes this benefit in kind is capped or limited and you will have to find any excess yourself, so make sure you can afford it. Primary school education starts for children in Dubai from the age of four and a half, and as you can imagine there are international schools available that cover almost all the major international curricula – from the British system to the International Baccalaureate for example. Fortunately there are a wealth of decent primary school options in Dubai. In this section of our Guide to Schools in Dubai we take a look at a range of primary schools available. We have selected a handful of the most popular, interesting or well rated primary schools to review, and provided full contact information for them. However, we do not endorse these schools in any way and have not independently checked them out – therefore we strongly recommend that you visit any primary school or educational establishment that you are considering for your child. Whilst a school can look good on paper, (or on the Internet), you need to see how it operates first hand before you can get a feel for whether your child will be happy to go there. Speak to other parents if you can, consider joining some expatriate forums discussing Dubai, and ask for personal recommendations about the school/s you’re interested in, and even take your child along for half a day if allowed so that they can see whether it’s acceptable to them. As with all levels of educational establishment in Dubai, the best primary schools have waiting lists and places are booked up well in advance of annual entry. So if you’re thinking about moving to the emirate you need to begin researching school options as soon as possible. Write to the schools you’re interested in and find out about fees, enrolment guidelines and perhaps prepare yourself for the fact that some schools even interview prospective parents before they accept their children! If you have a good employer they may be willing to help not only with school fees, but with getting your child enrolled at a given primary school – so ask well in advance of your relocation to Dubai about any help you will get. As you can imagine by the name of this school, it follows the American curriculum and it is an independent co-educational establishment. The American School of Dubai takes children from pre-kindergarten age through to grade 12 and so it’s ideal for those families who want their child to have an uninterrupted education or those who want their child to of course follow the American curriculum. The Australian International School has a primary, middle and secondary school and so it again offers parents the option of having their child educated throughout their school life within one establishment. The school is “quality assured” by Education Queensland which means that it’s the first Australian school in the Middle East and also the first where the state government of Queensland has entered into a partnership to provide the Queensland curriculum ‘offshore’. Facilities include everything from dedicated computer and music rooms to a swimming pool, gym and playground. There’s also a library, science labs and a canteen. The Cambridge International School in Dubai is part of the GEMS Education network that manages a number of international schools around the world. The school follows the British national curriculum and online you can download the school’s prospectus and get very detailed information about their core values, the courses they teach all levels and ages, their fees and specific key stage learning data. Educational standards are generally regarded as very high at this particular school, and your child can start at primary level and progress all the way through to sixth form. With a primary, middle and secondary school, this international educational establishment prides itself on providing schooling to pupils from a very wide range of ethnic and international backgrounds! The primary school alone is home to pupils from 75 different nationalities. The curriculum children follow is either the British or the International Baccalaureate and the facilities on offer are high grade. Parents are invited to visit to get a feel for the school before enrolling their student child because the school’s heads are confident that all parents will receive a warm and friendly welcome. This is another GEMS school and the curriculum followed is a combination of an enriched American curriculum in conjunction with the International Baccalaureate. Children can progress from primary to secondary school and the facilities on campus are excellent. There is also an afterschool club and online you can download a prospectus as well as complete fee information and school handbooks for your children. Dubai British School is a dynamic British International School that aims to be at the leading edge of educational innovation and excellence in British international education globally. They provide an international curriculum firmly rooted in the National Curriculum of England and enriched by specialist provision for the Arabic language and a strong performing and visual arts programme, as well as a multitude of sporting and extra-curricular activities and opportunities. This is purely a primary school and it covers the British national curriculum with massive emphasis on inclusion – i.e., every child can and is encouraged to try and get involved with every activity. It has a range of exciting and engaging afternoon activities from karate to cooking, and the broad range of subjects the school covers stands any child in very good stead for their future. Another GEMS school, this one is very popular and has a long waiting list. The curriculum followed is the British national, key stage based curriculum and the school’s onsite facilities to enable and encourage learning are excellent. The school has specialist facilities for children who have learning or developmental issues, there is a dyslexia unit and everything from the child’s nutritional health to their physical wellbeing is cared for and nurtured at this excellent and highly rated establishment. This is a primary school with foundation classes available as well. The school’s motto is ‘The Best by Every Child’ and the curriculum followed is based on the British national curriculum with additional focus on subjects such as IT, PE, music and languages. This school offers the primary and middle years programmes of the International Baccalaureate curriculum system and has specialist facilities for those with special needs as well. The facilities for education and play are excellent and there is great emphasis on the holistic development of a child. The school aims to equip expatriate children with the communication and developmental skills they will need to cope in an international and potentially often changing environment – therefore it is perhaps ideal for parents who have to relocate often. The above list of ten primary schools is just a handful of those on offer in Dubai. As you can see they range from schools teaching a very international curriculum to those only teaching the British or perhaps American curricula. Secondary school education in Dubai is for children aged between 11 and 18. Children entering a school at this level for the first time may be required to undertake a short exam so that teachers can determine their abilities. As with the nurseries and primary schools, the best secondary international schools in Dubai also get booked up well in advance. Therefore if you’re moving to Dubai in the near future it will be imperative that you enrol your student child as soon as possible and secure their place. Below is a selection of the most well known international schools in Dubai that offer secondary level education to the expatriate children. The list’s purpose is to provide you, the expat parent, with a school’s contact details together with a school summary so that you can easily see which establishments perhaps sound suitable. It will help you to do your own research online and through contacting the school yourself. We do recommend that you visit any school you’re thinking of sending your child to, also ask about pastoral care as well as average educational achievements. This school is an all girls’ school following the American educational model. The school is committed to serving the expatriate female child’s needs through ensuring she has cultural respect and through delivering educational excellence and inspiring personal growth. The school aims to develop intrinsically motivated global citizens who are committed to being leaders in community involvement and environmental awareness. Children are taken from primary age right through to year 12 and the onsite facilities and amenities are top notch. It’s hard not to be put off by the College’s horrendous website, but Dubai College is a secondary school following the British National Curriculum that has been long established in the emirate. The school is very well located right in the heart of modern Dubai, and its dedicated nineteen acres of land and space make it a fabulous setting for learning in many disciplines. There is strong emphasis on sport at the College, as well as learning – and students are encourage to develop their intellectual, physical, creative and social skills at Dubai Collage. The school is a member of the Council of International Schools (CIS), has received approvals from the UAE Ministry of Education and the International Baccalaureate Organisation (IBO) in Geneva, and is currently pursuing accreditation from the International Primary Curriculum in UK. Children are taught right the way through from primary to secondary level at this school, with a balanced approach being given to academic studies and extracurricular activities. The Emirates International School in Jumeirah has been in existence since 1991 and again, children are taken in at primary level with education continuing right through to secondary level. Teaching the International Baccalaureate curriculum, the Jumeirah Emirates International School places great emphasis on the educational needs of the expatriate child. Maximum class sizes are just 25 students, and onsite facilities and amenities are excellent and range from IT suites to science labs, from drama rooms to music rooms, 2 libraries and a fitness suite. Teaching the English National Curriculum, the English College in Dubai has a long history, (in modern Dubai terms) and it takes students from primary right through to secondary stage. The English College offers a wealth of extra curricular activities as well as a high academic standard of schooling. A member of the SABIS School Network, International Schools of Choueifat are located throughout the Middle Eastern region and beyond. They offer a unique schooling method where intense and rapid academic advancement is key. Students seemingly learn more in a shorter timeframe and with less critical effort applied through this unique system of education. Former students go on to reach the highest universities across the world, so there is clearly something to be said for this teaching method! This is a GEMS school and it’s purely a secondary school following the British National Curriculum – there are amazing facilities at this school that leads naturally on to the fact that the range of extra curricular activities on offer are great! Academically speaking this school is highly rated and places are in demand. There’s a Raffles Pre and Primary School as well as the High School that covers the IGCSE curriculum and takes children all the way through their A Levels. The school is owned and operated as part of the Emaar Group, and it has centres of excellence in sports, science, performing arts and fine arts. The range of co and extra curricular activities is pretty impressive as is the list of facilities that the school has for the benefit of its students. Offering education at Junior, Middle and High School levels, the St Mary’s Catholic School in Dubai follows the British National Curriculum. The range of subjects offered at IGCSE level is not extensive and it is even more restrictive at A Level, being confined to the sciences and business studies. This school is suited to those seeking a relatively formal learning centre for their children, with heavy emphasis placed on discipline and conformity. The Universal American School is accredited by the Middle States Association of Colleges and Schools, as well as the Council of International Schools. The school is therefore authorized to offer the International Baccalaureate Diploma Program (IB DP), which it offers in Grades 11 and 12, otherwise it follows an American curriculum. The school’s campus was designed by an American firm specializing in campus design and it features an indoor gymnasium, Olympic size track and soccer field, vocal and instrumental music rooms, art rooms, computer and science laboratories, libraries, and a swimming pool. The school is located in the Al Sufouh area of Dubai on Sheikh Zayed Road near Interchange 4. This is another GEMS International School and one with some very unique and special features. It currently follows the English National Curriculum although according to the school’s website it has plans to introduce the International Baccalaureate. Facilities include a complete Knowledge Centre Library, ICT Laboratories with computers and Internet connections, a Dance studio, Drama studio and Art studios. Also, a Television studio and Radio station is onsite, a first in UAE schools. Stage productions are held in the Auditorium which has seating for 470 people. Students wishing to expand their horizons can visit the school’s observatory for a breathtaking glimpse of the stars. When it comes to choosing a school in Dubai, be it primary or secondary, a good research and planning in advance is a key. As with all schools in Dubai, you have to visit to get a feel for the establishment in question. Also, consider speaking to other parents via forums connecting those living in Dubai with those thinking about moving to the emirate, and get personal and practical advice and tips about different schools and colleges in the region. One thing’s for sure, there is a massive wealth in terms of choice of school for your secondary school student, but with such choice comes a real burden of responsibility when finding the right school for your international child. If a secondary school is not a final step of your child’s education and they want to go to university, our guide to Dubai Universities can be of great help to both prospective students and their parents.